Lake Toho Trophy Bass Fishing! WELCOME TO TOHO BASS FISHING ADVENTURES LOCATED JUST MINUTES FROM DISNEY, UNIVERSAL AND SEA WORLD IN THE KISSIMMEE/ORLANDO, FLORIDA AREA. If you are ready to experience the thrill and excitement of trophy bass fishing on World Famous Lake Toho, you have definitely come to the right place. Helping clients catch big bass and creating memories that last a lifetime is my goal for each and every Lake Toho Bass Fishing Trip! We are a Full Time Lake Toho Guide Service specializing in trophy bass fishing with artificial lures or live bait to provide clients a once in a lifetime fishing trip. Most importantly, it's your day so expect the very best. My name is Steve Boyd and I am the owner/operator of Toho Bass Fishing Adventures. In business since 2002, I am a Former Marine, Full Time Trophy Bass Fishing Guide and Tournament Angler specializing in trophy bass fishing using artificial lures or live bait and grew up learning about bass fishing on World Famous Lake Toho. Whether you are looking for a trophy bass fishing trip using live bait or artificial lures you can count on my history of success as a tournament Pro and guide to help you get that fish of a lifetime. As one of a few Lake Toho bass fishing guides that grew up in Orlando I use this lifetime of experience to consistently put clients on trophy bass. Trophy bass fishing on Lake Toho is a great way to spend time with the family so women and children are always welcome. Children are the future of the sport which is why I have dedicated an entire trophy bass page to the children who have taken memories home of their bass fishing trip. No one has more kids holding Lake Toho Trophies than we do! Every Trip Comes with a No Fish, No Pay Guarantee that is in writing to back up just how strong my commitment is towards each and every client having a successful Orlando Bass Fishing trip. A Lake Toho bass fishing trip may only happen once in a clients lifetime and choosing the right guide for your trip is an important one. All of the information in this site is designed to help clients get as much information about me and my experience so that making the right choice is an easy one. Feel free to visit my Bio page for details about my background and tournament experience. For information on my trophy catches, featured articles and sponsors visit my Lake Toho Trophy page. Remember your not hiring just any Lake Toho bass guide, you are hiring a true Professional with over 30 years of mastering the area lakes and the bass that hold them. Clients are paying for a guides knowledge of the lake, where big bass are & how to catch them. As a Native Floridian, I grew up right here in Orlando, Florida spending many weekends with my family bass fishing on the St. Johns river, Lake Toho and Lake Kissimmee. When I wasn't fishing with my family you could usually find me fishing the Econ River or any pond that I could get to with my bike. 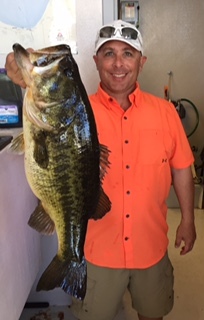 Photo pictured is of a 12lb bass caught from Lake Toho by Toho Trophy Bass Adventures Guide Steve Boyd. To do our part, Toho Trophy Bass Adventures practices Catch and Release on all fishing trips and encourage photos and Replica mounts. We specifically target trophy bass only and follow B.A.S.S. Founder Ray Scotts philosophy on harvesting bass. The bass we catch are not considered harvesting bass and therefore are released to maintain the trophy resources we have for future generations to enjoy. Clients don't get to see it but often we catch big bass multiple times on different trips that couldn't have been caught and enjoyed had they been taken from the lake. Wondering which lake to choose for your bass fishing trip? The opportunity to experience trophy bass fishing in the Kissimmee area is literally just outside your doorstep wherever you are staying in the area. With a long history for producing trophy bass Lake Toho is a regular stop for top bass pros competing on the Bassmaster and FLW Tour. Adding to it's fame, Lake Toho became the current record holder in 2001 for the one day, five bass limit at 45lbs 02 oz averaging 9lbs per bass. With such amazing choices to spend your day all minutes from the theme parks you can look forward to a great fishing trip. Wanted to say a big thanks for another great fishing trip especially on short notice. I thought the trip was going great with a couple of 4 lb fish and a 5 to start the morning and then everything changed with that 12lb trophy. Every trip down has been great but I'm not sure how you are going to out do yourself after this.